Forget organic and locally grown food—in America’s poorest urban neighborhoods, it’s hard to find any affordable fruits and vegetables at all. Six grocery stores serve South Los Angeles’ population of 688,000. West Oakland has no supermarkets but close to 60 liquor store. 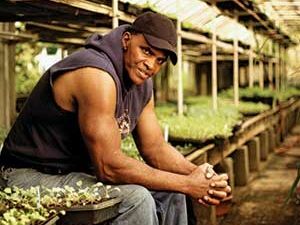 But thanks to former NBA draft pick Will Allen, a couple of American cities are experiencing a produce renaissance. Sixteen years ago, Allen gave up a lucrative job working for Procter and Gamble’s corporate marketing department to found Growing Power, a tiny working farm in the heart of Milwaukee. “Right down the street was the largest housing project,” says Allen. “The major grocery store had pulled out—so I said, ‘This should be a great place to sell produce.’” He was right: Today, the farm sprawls across three city acres crammed with livestock pens, fish trenches, worm compost bins, and greenhouses constructed from pipe and plastic sheeting. Selling weekly farm-share boxes for as little as $14, Growing Power is one of the country’s most productive urban farms—it sold more than $200,000 worth of produce in 2007, and Allen has recently expanded his operations to Chicago.